(0 Customer Reviews) | Write Review 10 issues per year Halifax Magazine is a vibrant and sophisticated city-lifestyle magazine, reflecting the trends, culture and mindset of the increasingly cosmopolitan population of Metro Halifax. With engaging profiles of the city’s unique personalities and features that mine its rich cultural scene and take on the issues that matter, Halifax Magazine celebrates and challenges Atlantic Canada’s most exciting city. Every issue focuses on the people, places and things that make Halifax what it is, and what it has the potential to become. The Cityscape section is a quick snapshot of what’s happening in the city. Explore the cutting-edge business and political issues, not-to-be-missed events, best shopping buys and the latest dining and nightlife news—every facet of Halifax’s urban experience. 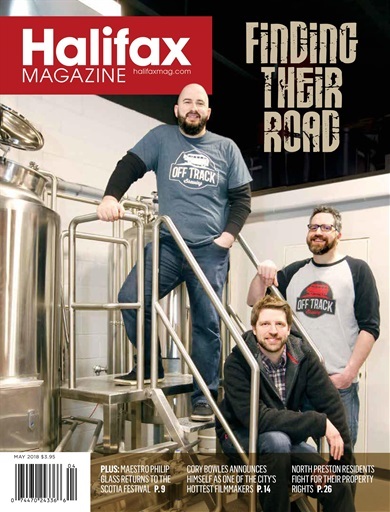 Halifax Magazine celebrates the return of Nova Scotia Craft Beer Week with a look at must-try new beers and breweries; in our cover story, Kim Hart Macneill chats with the founders of Bedford’s Off Track Brewing. Plus: Nova Scotian residents fight for the property rights, Halifax filmmaker Cory Bowles garners international acclaim, and a look back at the case of a violent stranger who terrorized Halifax in 1998, and much more. Halifax Magazine is a vibrant and sophisticated city-lifestyle magazine, reflecting the trends, culture and mindset of the increasingly cosmopolitan population of Metro Halifax. With engaging profiles of the city’s unique personalities and features that mine its rich cultural scene and take on the issues that matter, Halifax Magazine celebrates and challenges Atlantic Canada’s most exciting city. You'll receive 10 issues during a 1 year Halifax Magazine magazine subscription. You'll receive 10 issues during a 1 year Halifax Magazine magazine print subscription.